I was lucky enough to spend the last two weeks working in Solomon Islands. My colleagues and I flew from Honiara to Munda in New Georgia, a remote island toward the border with Papua New Guinea. The airstrip in our final destination, the island of Gizo, was closed, so we travelled by speedboat across lumpy green seas for the final hour-and-a-half. When we arrived I was glad to see that aid donors were building a new hospital and that the airstrip was being upgraded from coral to asphalt. The last time I visited, five years ago, a tsunami had destroyed most of the houses near the coast, sending the inhabitants to higher ground in the middle of the island where the UN had built a tent village. This time there was little other sign of progress other than the hospital and airstrip. Bad weather meant that supplies hadn’t reached the island for several days. In a country surrounded by sea, we were surprised to discover that there was no fish to eat. Because of poor transport, people struggle to reach the main island, which means medical problems go undiagnosed and untreated. Even with a new hospital building medicines are likely to remain limited in availability and staff overworked. The roads seemed just as bumpy as before, and by all accounts the tourist trade hadn’t picked up locally, a trend which was backed up by the national statistics which show that only about 22,000 visitors arrived in the country last year, little higher than four years previously. In 2008 the Solomon Islands ranked 128th out of the 177 countries on the UN human development index, classifying the country as having ‘medium’ human development. Although the criteria for measurement of the index changed and more countries were added, four years later human development has been downgraded to ‘poor’, with the country ranking 143rd out of 186 countries. Despite aid donor spending of around AU$3 billion (£1.75 billion) in the last decade, economic growth has slipped in recent years to around 4%, barely more than population growth. Average per capita income is only about US$1,100, but in the rural areas it’s considerably lower. People in Gizo and New Georgia told us they feel somewhat abandoned by the capital, Honiara, where most economic activity is located. Central government has very little influence, and i’m told that the more remote areas more or less fend for themselves. 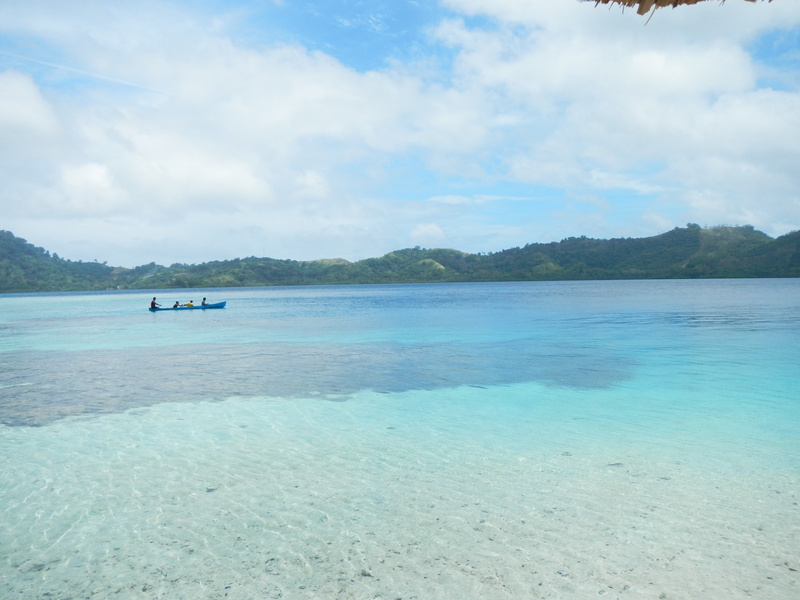 The Solomons, like many Pacific island states, is almost a libertarian wonderland. The state was already minimalist, but recent years have seen yet further liberalisation, government spending cuts and a move toward greater private ownership of industry. In 2007 import tariffs were lowered to three bands, with a maximum of 10%. The fisheries, forestry and mining industries are largely privately-run — and foreign donors encourage austerity. If laissez-faire were really such a great idea you’d expect rip-roaring economic growth. The reality is quite the opposite. Because of poor control of forestry and weak environmental regulation, the export of logs from natural forests is forecast to drop to zero by around 2015. Mining hasn’t picked up as predicted. Despite the efforts of several motivated and qualified staff, the government struggles to exert much influence over the economy. Liberalisation has deprived the Solomon Islands, like so many least-developed countries, of the tools to promote economic development. Industrial policy would never result in the development of a manufacturing sector — the country is too small and far from big markets. But some measure of strategic policy could lead to the development of certain economic sectors: agricultural processing, tourism and perhaps other services. Small island states like Mauritius provide encouraging examples. The rhetoric surrounding trade policy in the Pacific is that trade agreements will solve all the country’s problems. The country is negotiating four separate sets of negotiations, so that trade policy has come to be synonymous with trade deals rather than building productive capacity, which is the vital missing element in economic growth. The problem isn’t the demand-side; it’s supply. The islands just don’t have much to sell either at home or abroad. Given that development economists don’t have laboratories, visiting developing countries is the next best thing, and I don’t think academics do nearly enough of it. So much ‘economics’ consists of cranking the handle on complicated mathematical models in US and European universities rather than actually observing what happens in the real world, that I think a lot of economists end up barking in the wrong forest, never mind up the wrong tree. Even what passes for empiricism usually amounts to statistical manipulation, often using unreliable data. Many of the criticisms of mainstream economics (mine included) revolve around its alleged ideological nature: it preaches free-market solutions because it supports prevailing relations of production. But to some extent the problems with mainstream economics also result from its lack of genuine empiricism, by which I mean case-studies achieved through immersion in local culture and economic circumstance. Economists just don’t bother going to developing countries and finding out what happens. They’re so content to sit at their desks doing maths that they remain ignorant of the way the world really works. And in the Solomon Islands, that means that a quarter of people live in poverty; that kids only go to school for an average of 4.5 years; and that 36 out of every 1,000 children won’t see their fifth birthday. Those bland numbers represent injustice, the kind of injustice that has to be experienced first-hand. I do so much agree. Couldn’t agree more with much of the anlysis here. It’s scary the inordinate sway that economists in Europe and the US (and Australia) have over policy-making in developing states, including in the Pacific. Drawing up elegant theoretical models and manipulating imperfect data-sets are one way to derive policy advice. Unfortunately it’s too often divorced from lived local realities – where culture, geography, politics, institutions, history – all need to be taken into account when thinking through policy. As you say, mainstream advice also confuses liberalisation and development (or assumes the former will automatically lead to the latter in all states), and the emphasis is on integration into the global economy – through negotiating FTAs, joining the WTO etc. You have to wonder the opportunity costs of encouraging the best and brightest in small Pacific states to engage with the global trade regime and pursue esoteric things like signing onto global intellectual property agreements (which are inherently protectionist mind you) instead of developing domestic policy to support local productive capacity! The Solomon Islands have plenty of natural and human resources to develop domestic and international trade. The world still wants tropical crops (sandalwood, coffee, cocoa, vanilla, copra, palm oil etc), the islands have mineral deposits, the Western Pacific’s tuna stocks are one of the world’s largest remaining fisheries, tourism has considerable potential etc. However realising potential is a huge challenge. At the moment, the non-monetised sector – the culturally important traditional economy – is far and away the largest and most important segment of the Solomons economy (if ‘important’ measures keeping people alive). Village farmers with access to communally held land grow and distribute fresh vegetables, root crops, nuts and fruits throughout the country. I’d have thought linking this sector with the formal economy and international markets is a key policy challenge, and one that is not well served by an inordinate emphasis on liberalisation. Thanks Wesley. I agree. 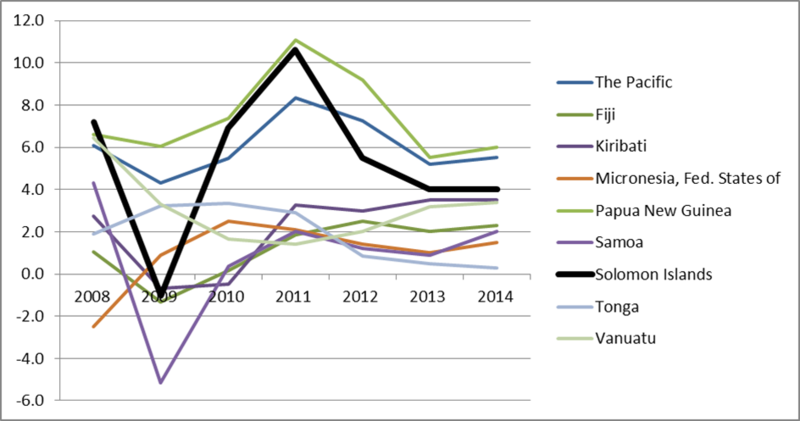 Without at all dismissing the other sectors, I particularly think that services such as tourism have a prominent role to play in development in the Pacific islands — look at the successes of Fiji, the Cook Islands and Vanuatu — and that the services sector like any other needs proactive stimulus in order to grow. The tendency is to think that services exports like tourism (and ICT) can expand sustainably without government support, when in fact they need assistance and regulation. 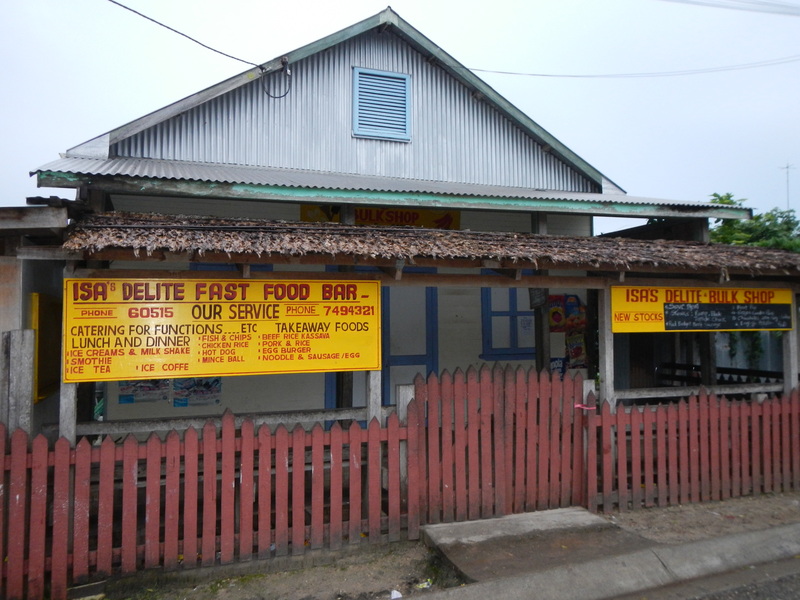 Sometimes critics of neoliberalism dismiss services, possibly because they are harking back to the supposed golden age of industry (not that you do this) but I do think services must play (and already do play) a prominent role in small island developing economies. Of course development is about diversification, not specialisation as the theory of comparative advantage suggests, so a service like tourism should only be one part of the picture.